I've always felt I was born 50 years too late. The era of the Roaring '20s, F. Scott Fitzgerald, flappers, the Charleston, ragtime music, and even the pre-War years were meant for me. That era exudes a sense of elegance, romance, and adventure that have always intrigued me. They say you can't go back, and indeed you can't, but fortunately for me at least, you occasionally run into others who also appreciate the romance and adventure of that bygone age, and have made it their mission to bring that experience to the world traveler. That's exactly the motivation behind Sea Cloud Cruises, a tiny German-based line sailing just three small ships that together entertain no more than 250 passengers in some of the most idyllic destinations in the world. The line draws its name from its flagship, the vintage yacht launched in 1931 as a home afloat for Marjorie Merriweather Post—heiress to the Post Cereals and General Mills fortunes—and her then-husband, E. F. Hutton, the Wall Street financier. Built in Germany and originally launched as the Hussar V, one in a series of so-named yachts owned by Hutton, it was the largest, safest, and most elegant sailing vessel of the day, furnished with marble fireplaces and bathrooms, gold-plated fixtures, and fine art. In short, no expense was spared in its conception and execution. It served that famous couple and their young daughter, actress Dina Merrill, as a home-away-from-home in their travels around the world until the mid-1930s, when they were divorced—and Marjorie got the yacht! From then on, the story of the yacht, renamed Sea Cloud when Ms. Post remarried, gets rather complicated. A period of glory in an ambassadorial role in Europe saw kings, queens, and dictators as guests. In World War II, it was leased to the U.S. government for a dollar a year, stripped of it masts and fancy fittings, and put on submarine patrol off the Azores and Greenland. After the war, it was acquired by Trujillo, the Dominican Republic's dictator, and was party-central for the Hollywood glitterati. It had a rather checkered existence during the '60s, '70s, and '80s, alternately serving as a school ship and a so-so cruise ship, then just plain sitting, wasting away. Fortunately, in the early 1990s Sea Cloud came to the attention of a group of German ship owners and investors who appreciated the ship's history and recognized her potential. They brought her back to Germany, where Sea Cloud was restored to her original grace, style, and five-star cruise-ship ambiance. Apparently, there are enough nostalgia and nautical buffs like me that the company also launched Sea Cloud II—a near replica of the original sailing barque—in 2001 and, also in the same year, an elegant vintage-looking river cruiser, River Cloud II. But enough history! I first saw Sea Cloud II some years ago, lying at anchor in St. Georges, Grenada, one of the prettiest little harbors in the Caribbean, if not the world. Her sleek white hull and tall masts cut quite a figure against the verdant hills and red-roofed homes surrounding the harbor. 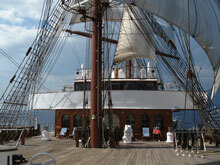 Then and there, I added voyaging aboard one of this line's sailing ships to my "Life List." This winter, we decided it was time to see some parts of Europe that were new to us, and what better way to sample them than by sea? We spent hours poring over Sea Cloud's beautiful brochure, salivating at the many different summer itineraries offered—the Riviera, Croatia, the Greek Isles, Turkey, Venice, Barcelona. It was tough to decide. None of them seemed to repeat, and all incorporated unique and smallish ports-of-call that had even a veteran world traveler like myself Googling to research. In the winter, the line's offerings focus on the Caribbean. Of course, in between there are ocean crossings with stops at some of the Atlantic island groups you pass in getting from one place to the other. Other years, the line has offered cruises along Europe's Atlantic Seaboard and through the Baltic. In mid-May of 2012, we boarded Sea Cloud II in Naples, headed for adventure along Italy's Amalfi Coast and around Sicily, with a final destination of Malta, all but the latter being new territory to us. But the destinations are for another story. 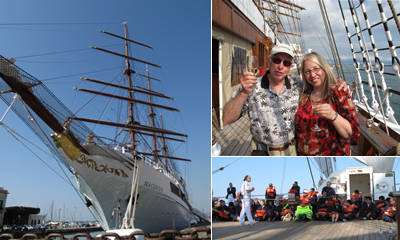 We'd like to tell you about our experience aboard Sea Cloud II. By comparison to any of today's average cruise ships, Sea Cloud II is extremely simple. You could easily define the ship by what she does not have: no casino, no rock-climbing walls, no noisy pool scene amped up by rock music—in fact, no pool at all—and, of course, no blaring announcements about the next activity taking place on the Lido Deck. None of that! I'd prefer, however, to define her by what she is, a lithe and elegant lady, beautiful in profile, gleaming white with tall masts towering over her expansive teak decks. In port—and with her small size, she's usually docked in close to the action—she's a real head-turner, with everyone snapping pictures of her. Under sail, she's a vision of loveliness from the past. Inside and out, the brightwork—varnished teak or mahogany to you landlubbers—is ever so bright and her many brass details and trim gleaming. And they should! Whenever they weren't attending to sailing the ship, the crew was polishing, painting, and scrubbing something. Inside, she's every bit as elegant and simple. There are just a few public areas, and they're quite nautical in design and decor, with lots of polished wood paneling, gleaming polished brass, and halls decorated with original art, including both vintage and modern photos of sailing the Sea Clouds. A gracious dining room is lined with windows for a panoramic view. A top deck lounge with bar, baby-grand piano, and comfortably elegant leather seating offers a quiet place to read, also with sweeping views. A small library sitting below the bridge and overlooking the foredeck is another escape. There's a computer there to send e-mail missives home, should you feel so inclined. And yes, there is a Lido Deck! It is the pièce de résistance—an open and expansive teak deck at the stern, with a shady canopied sitting and bar area at its center, and chaises and daybeds sprinkled around the fantail, something that's missing from the stern of any modern ship. It served as the venue for early-riser's breakfast, lunch in the idyllic Mediterranean weather we enjoyed, a barbecue dinner under the stars, a favored hang-out for sundowners, and quiet sunbathing in between. To quote Dexter (Bing Crosby) as he described the yacht he and Stacy (Grace Kelly) honeymooned on in the movie High Society (from The Philadelphia Story), "She was yar!" That was our first and lasting impression of Sea Cloud II. Anyone with saltwater running in their veins, or who just likes things vintage and nautical, would certainly approve. Gail and I settled most comfortably into our spacious, 247-square-foot Junior Suite with an iced bottle of champagne, fresh-fruit bowl, and goodies plate (all standard) to greet us and get our trip off to a celebratory start. 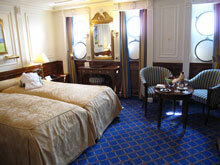 The look and feel of our cabin, like the rest of the ship, was vintage and yacht-like. It sported a spacious sitting area with a mini-fridge stocked with free non-alcoholic beverages and tucked into a sideboard, plus a small TV and a marble faux fireplace modeled after the real ones aboard the original Sea Cloud. An elegant inlaid-marble-lined bath with large (for a ship) shower/tub and gold-plated fixtures modeled on the originals was plenty spacious for one, a bit squeezed for two. A wood-paneled walk-in closet with "his" and "hers" sides offered more than enough storage for cruise clothes. Several large windows looked out over the Promenade Deck, which at first was a concern for privacy, but we noted that that deck was little used. Gail (the non-sailor between us) was impressed enough with the cabin to contemplate a world cruise aboard. We checked out the other cabins, all equivalently luxurious if somewhat smaller. We were impressed most by their efficient design that took full advantage of their space. In fact, we agreed there was not a cabin we would not have been comfortable cruising in, although with the entry level cabin, the bunk beds (one cleverly hidden by day) might have been a bit unromantic. My favorite for value would probably be the Deluxe Outer Cabins, which eliminated the tub in favor of a modern glassed-in shower and offered more counter space. Most mornings, we were either sailing into a new harbor or already at anchor by breakfast time. If you were signed up for a shore excursion, you usually headed out pretty early. Only one shore excursion was offered in each port, but it was generally well designed to take advantage of the attractions of each destination. Separate guides were provided according to the language preferences of each group, since our ship had a large German-speaking contingent and a much smaller group of English speakers. Being independent sorts, Gail and I mostly struck out to explore ports on our own. Personally, I prefer to go at my own pace, stopping for photos or a gelato, espresso, or beer where and when I want and just relaxing, rather than trying to absorb the usually overwhelming amount of information spouted by local guides. Besides, I find most cruise line's shore excursions to be over-priced. In some places like Palermo, we took a city tour aboard the "hop-on, hop-off" bus. I've found that these provide a good overview of a destination with just the right level of information for me to appreciate it. In smaller ports, we just wandered the quaint village streets, stopping in a church, cathedral, museum, or castle for a self-guided tour if the mood struck us. We did sample one of the ship's excursions at Trapani, where the main attraction, the ancient mountaintop walled city of Erice, was too far to contemplate doing on our own. We felt that excursion was well run and the guide good. Friends we made on the cruise who took all the excursions generally felt they were well run. One service the ship did not provide and I felt would be helpful was a lecture or introduction to each port before arriving. My favorite experience aboard was the actual sailing of the ship and the full day spent at sea. Unlike any other sailing ships in the cruise market, the Sea Clouds are manually sailed. That means when they decide to set the sails, usually in the afternoon and on full days at sea, the seamen (and women!) clamber up into the rigging, manually unfurl the square sails, hoist the yards and the jibs, and set them to the prevailing winds. There are no computers involved and the only concession to modernity is that the winches for handling sheets and mooring lines and the windlass for hauling the anchor are electric powered. Otherwise, it's all done the old-fashioned way—climbing the rig, hauling lines, and belaying them with old-fashioned pins. It's quite a sight to see! The first time the sails were set, Katherine, the First Officer who hails from Canada, handed out a diagram giving the names of each sail and parts of the rigging, and then provided a good real-time explanation of what was happening aloft. In all, there are some 24 sails: upper and middle gaffs, upper topsail, fore topgallant, main topmast staysail, main royal, and the list goes on. When all sails are set, there's an impressive 30,000 square feet of canvas aloft to push Sea Cloud II toward the horizon. Seeing those sails unfurl and catch the breezes is quite the sight, enough to bring tears to the eyes of the ancient mariner or a sailing buff like myself. I don't believe we ever did set all those sails, and the breezes we encountered in the Mediterranean never exceeded about 12 knots. In those conditions, I can't say that Sea Cloud II danced in lively fashion through the waves. The fastest we ever did was about 6 knots, but I'm told that in better conditions and with full sail, she's achieved better than 12 knots. The positive side of that is that the seas we encountered were quite calm, and we experienced almost no pitching or rolling. However, to make its schedule, the sails always came down around sunset and the diesel engines were quietly fired up. While Sea Cloud II's rigging and sailing aspects are very traditional and authentic, its navigation and other systems are state-of-the-art. You won't see the Captain out on the bridge wings shooting stars with his sextant—though that might make for an interesting lesson for passengers with a nautical bent. The ship does maintain an open-bridge policy, unlike most ships these days, and if you stop by you might be surprised to see that the steering wheel, for use when she's manually steered, is about half the size of your car's steering wheel. In reality, I'm guessing that most manual steering is done with the "joy stick." Of course, most of the time she's on autopilot tied into GPS, chart plotters, radars, and a full array of instruments monitoring all aspects of the ship. Beyond visiting the bridge occasionally, there was a very good engine tour on our only full day at sea sailing between Trapani and Siracusa for those who cared to learn the inner workings of the ship, which are impressive. A knot-tying demonstration and lesson also were provided by one of the Filipino crew. My favorite daytime activity, and that of most passengers while at sea, was relaxing and reading. For some, that also meant working on their tans in the company of friends near the bar at the fantail. I preferred to find a quiet, private, and shady place—and with a max of 90 passengers and lots of deck space, there are plenty of these—most often under billowing sails, in which to read a good novel, enjoy the vistas of sea, sky, and passing islands and ships, and perhaps take a siesta. As you might imagine, the entertainment aboard Sea Cloud II is rather low-key. A guest concert pianist performed on a couple of occasions around cocktail hour, and the ship's regular pianist performed on the Lido Deck in the evenings and for special occasions, like the outdoor pig roast and barbeque. Of course, there was the requisite Captain's reception the first night, and toward the end of the cruise the crew got decked out in their fanciest nautical attire and belted out sea shanties, with passengers welcomed to join in. Some songs were familiar—"What Do You Do With a Drunken Sailor" and "Blow the Man Down"—while others, like "Si Filimon," a Tagalog fisherman's song, were enthusiastically sung by the mostly Filipino deck crew. Needless to say, a good time was had by all. 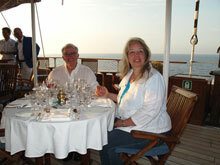 When most people think of cruising, the dining experience is paramount in their minds. Sea Cloud keeps it much simpler, unlike typical large ships where the "in" thing is to provide multiple dining venues and themes. It's more like dining aboard a private yacht. But don't confuse simplicity with lack of quality or originality. At breakfast we enjoyed a combination of an international buffet with a strong European influence and the usual a la carte menu of omelets, eggs to order, and pancakes. Frankly, the buffet selections of fresh fruit, smoked salmon, trout and duck breast, cold cuts, multiple cheeses, hot buffet items, and more was so diverse and of such quality that we seldom ordered off the menu. At the center of the dining room, a table groaned under the weight of a plentiful selection of fresh-baked breads, pastries, and melt-in-your mouth croissants. A side story seems appropriate here. On our second morning aboard, headed from the Amalfi Coast to the Aeolian Islands, Gail and I struggled out of bed at 5 a.m. to take in the flames and smoke spewing from the cone-shaped, very active volcanic island of Stromboli as we sailed by. Unfortunately, its peak was shrouded in clouds, but the morning still left an impression. The aromas of baking bread wafting over the deck from the ship's bakery provided a memory that will linger with me forever. Just as we decided to call it quits, the volcano roared in the distance, as if giving its approval to the feats of the baker, who was up every night from midnight to early morning preparing the next day's delights. I am a firm believer that the quality of the bread served by any establishment is a telltale sign of the quality you might expect from the rest of its dining experience. Let's just say, the chefs of Sea Cloud II did not disappoint. Lunch, invariably served al fresco on the Lido Deck in the beautiful Mediterranean weather we experienced, was perhaps the most substantial and diverse meal of the day. A long buffet table offered various salads and cold dishes, while a station set up to one side offered pastas, hot fish, chicken, and beef dishes. A good international selection of wines and beers was served, gratis, with both lunch and dinner, and of course, there was champagne for our mimosas at breakfast. Dinner is served in one open sitting starting at 7:30 p.m., and given the ship's size—only 90 passengers at most, and we were sailing with about 45—you are expected to be reasonably prompt for dinner. No dining at Spanish hours here! If I had one critique of the evening dining experience, it would be that no effort was made to introduce passengers to one another. The concept of "open seating" was too broadly interpreted, with no maitre d' performing the role of facilitator in matching guests who might like to meet and share a meal. In fact, there was some degree of polarization between guests who were primarily German-speaking and our smaller group of English-only speakers—and what better opportunity for them to get to know one another than to share a meal. It would have made for a much more interesting cruising experience. We were told that the woman who normally serves in this function was under the weather, but a replacement for her should have been found. While the attire for most diners was casually elegant, the dining experience itself was very elegant. Selections for the four courses were limited but well considered, with two choices for appetizer and main courses, plus a vegetarian selection and one soup. There were several options for dessert and, in the European tradition, an excellent cheese tray to end the meal. While the selection of appetizer and entree may have been limited, there was no limitation on the quality of ingredients, the preparation, the beautiful plating, and the formal but friendly service. Examples of the delicious fare include the appetizer Spargelmousse mit safrongelee und riesengarnele (translation: Asparagus mousse with saffron jelly and king prawn) and an entree of gratinated saddle of venison with port wine sauce and olive-macaire potatoes. I asked Tina, the ship's gregarious Hotel Manager, how Sea Cloud II is provisioned, and was told that, in addition to central provisioning at the beginning of each cruise, the ship's chef often shops local markets for fresh seasonal produce and fish, to keep the dining experience relevant to the area where Sea Cloud II is sailing. Try finding that on the larger ships! Overall, I'd give the dining aboard Sea Cloud II a 4.5 out of 5.0, very near Michelin one-star in terms of quality and table service. For a cruising experience to rate as top notch, a lot of things have to come together perfectly, and one of those is service. Sea Cloud II sails with a very multi-national crew of about 60. They hail from Germany, Holland, Italy, Switzerland, the Philippines, Eastern Europe, Russia, and more. About half othe crew is charged with running the ship, the rest with taking care of the passengers—and they do a very good job at both! I've already written about the excellent care they take of the ship, the super cuisine, and the attentive dining service. We hardly ever saw our cabin steward, which is as it should be for the passenger's convenience, but our cabin was always beautifully attended to twice a day. When we did see him, our steward was always cheery and welcoming. 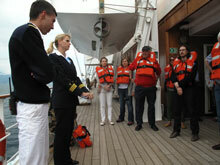 On the day we set sail, we were called to the de rigueur safety drill within an hour, and it was more thorough than any I've ever attended before. On our one day at sea, I was sitting on the foredeck reading when I saw all the crew donning life preservers and parading down one side of the ship. At first I thought they knew something about the condition of the ship that wasn't apparent to me. It turns out that, on a very regular schedule, they go through a thorough training on multiple aspects of the ship's operation including safety. Later, they were all assembled on the foredeck, and I listened in as they were given a lecture on the minutia of pollution-control procedures, waste disposal, everything. Clearly, this is one ship-shape ship. There was one other thing I noticed, but it only sank in toward the end of our cruise, when sailing into Valletta. Along the way, we hadn't seen another cruise ship at the ports we visited. I don't know if that was happenstance or planning. We pretty much had the destinations to ourselves, and that's one of the advantages to traveling on a small ship with unique itineraries. The reality of that advantage struck home as we entered the dramatic port of Valletta, an ancient walled fortress designed for the small ships of the Middle Ages. We, however, entered the port as part of a parade, surrounded by mega-sized cruise ships which were about to spew out thousands of passengers. Even though our ship was dwarfed by those around us, I felt rather smug knowing we had been voyaging aboard a real ship, not just a floating hotel. There, with the fortifications of Valletta as a backdrop, Sea Cloud II seemed at home with its vintage beauty, grace, and uniqueness, while the mega-ships looked more like intruders. My parents, who themselves reveled in the era of the original Sea Cloud and enjoyed many a passage on the grand dame ocean liners of yesteryear, had a favorite expression that seemed to fit the situation: "Diamonds don't come in dry goods boxes!"